Refer to the directions below to subscribe to a UCSD mailing list. Leaving the password fields blank. Mailman will generate and e-mail a password to you. Note: View or change your list options to change this preference any time after you subscribe. You'll receive an e-mail with "Confirm" in the subject line, followed by an alpha-numeric string. Follow the e-mail's instructions to confirm your subscription. Note: Some mailing lists require administrator approval before your subscription is enabled. 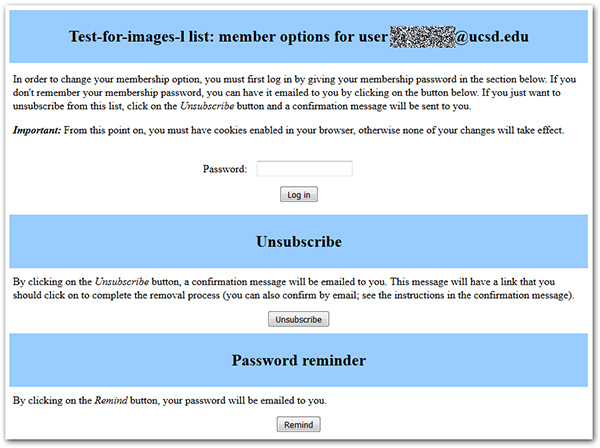 Logging in takes you to the Membership Configuration page where you can change your e-mail address, mailing list password, and set your subscription options. Enter your mailing list password and click Log in. Note: If you forget your mailing list password, scroll down to the "Password reminder" section and click Remind for an e-mail reminder. Option: To change your e-mail on all mailing lists you subscribe to, click the Change globally box. Click Change My Address and Name. 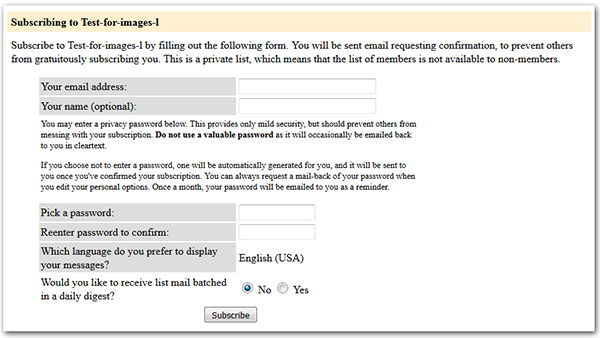 Option: To change your password on all mailing lists you subscribe to, click the Change globally box. Note: Not all lists have archives. Going to the "Welcome" e-mail you received when you subscribed and click the link that ends with your e-mail address. Locate the Unsubscribe section on your screen and click Unsubscribe. You'll receive an e-mail with "confirm" in the subject line. Follow the e-mail's instructions to complete the unsubscribe process. To find out which mailing lists you are already subscribed to, email postmaster@ucsd.edu.